Like Game of Thrones? Well here’s another epic life adventure story for you. 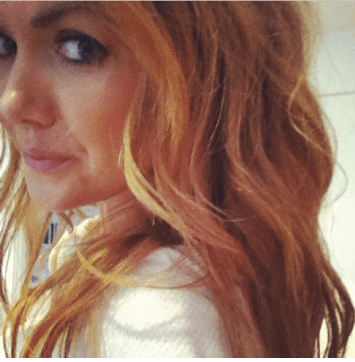 Strawberry Blonde Hair: My Epic Journey From Too Blonde to Too Red and Everywhere In Between. Anyone who has tried to color their hair strawberry blonde probably knows what I’m talking about. I’ve been too blonde, too red, way too red, too brassy. Then there have been times where I’ve used the same exact color and gotten a totally different result. Doing your color on your own can be frustrating, so I want to show what I’ve used and the results I’ve gotten, to hopefully help you skip some of that frustration. Make sure you check out my latest Strawberry Blonde post, for my current (and all-time favorite) formula. My hair is past my shoulder blades. I usually require two boxes to saturate my hair. Also, my hair is about 90% grey. Yikes. I know! (Now you have ALL my secrets!) I started to go grey at 20, so color generally comes out a bit lighter on me than if I had no greys. If you have no or less grey in your hair, your color will probably come out darker or more red than mine. My hair used to be a light reddish brown, before going grey. If it’s your first time going strawberry blonde and you are either dark brown or platinum blonde, I highly recommend going to a professional colorist, who can color correct the dyed hair. From there, you can touch up your own roots going forward, but you’ll have a good base. For golden blondes, this post on transitioning from darker blonde to strawberry blonde hair might be helpful. I used to set the timer for 40 minutes after I’d finished applying the color (30 minutes if you have no greys, 40 if you do), then for the last 10 minutes I’d pull the color through the ends. It was coming out a bit brassy though. So now, when I do my own color, I set the timer from the second I start putting the color on my hair and work fast to get the color applied. Then as soon as the timer goes off at 40 minutes, I’m in the shower rinsing the dye out. This has been my go-to color for years. It does come out more blonde than red on me. The red starts to really fade about 3 weeks in, depending on how much you wash your hair and what shampoo/conditioner you use. L’Oreal Excellence Reddish Blonde day after coloring. L’Oreal Excellence Reddish Blonde right after coloring, different lighting. L’Oreal Excellence Reddish Blonde after a couple weeks post coloring. I decided that I wanted my hair to have a little more red in it, so I tried Red Penny. This shade came out just too red for me. It wasn’t as natural looking as the Reddish Blonde shade. So…one day I decided to combine the two shades to see what result I would get. I loved it! It was a really pretty shade of strawberry blonde with just the right amount of red to blonde ratio for me. I combined the two boxes in a hair color mixing bowl ($1 from Sally’s Beauty) and a brush (I used one that came in an old kit, but I think they are only a couple dollars). After really mixing the shades up, I used the brush to paint the color on my roots. I ran it through the rest of my hair for the last ten minutes. L’Oreal Excellence Red Penny & Reddish Blonde combined. My favorite result from at home color so far!! My favorite strawberry blonde shade so far! I have tried a lot of brands, but L’Oreal Excellence remains my favorite. It’s affordable and the color range is my favorite. AGEbeautiful Color from Sally’s Beauty. I tried the 7RC Dark Strawberry Blonde and was so disappointed with it. The color came out so, so dark. More like a light brown than a blonde. And the color had a metallic sheen to it. I wouldn’t have totally disliked the color if it had just been too dark, but the metallic finish was too much. It’s hard to describe, in pictures it looks ok, but when my friends saw it in person they all said “woah, its SO red.” I tried to lighten it by using the 9RC Light Strawberry Blonde Blonde a few weeks later, but you can’t lighten color with color (which I knew but tried anyway because the HEART WANTS WHAT THE HEART WANTS.) It’s a shame their reds are so metallic, because the hair dye itself made the condition of my hair feel amazing. It was really silky after coloring and didn’t feel dried out. I was a hair model for a stylist who used Wella color and I thought their line of color was really impressive. I don’t know exactly which shades she used, but it was a pretty, soft strawberry blonde. *Update* I currently use the Wella Color Charm line, full details on my formula in this post. I was also a hair model for Aveda for a few of their hair shows. They colored my hair a medium copper. It looked pretty, but I personally like my hair a little more strawberry blonde than red. 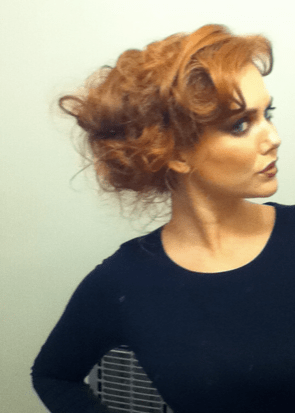 Fun, crazy hair for the show! When I get my color professionally done, I see Jonathan James at Harlot Salon in Los Angeles, CA. He uses L’Oreal Professional color, not sure what shades, and last time he added some highlights around my face, which I am in love with (they are baby fine highlights, the kid knows what he is doing, SWOON). He is fantastic and so talented, I am very lucky to have found him. *Update* I have been doing my hair at home full time with the Wella Color Charm formula from this post. I do still see Jonathan for my haircuts though because he is truly the best!! Color & Blow out by Jonathan James. I hope this post helps, whether you are considering doing your color on your own or just need some color inspiration for the salon. Let me know if you need any advice or have questions!! Continue Reading: PART TWO POST! Updated with more colors & brands that I’ve tried. Wondering which makeup shades look best with Strawberry Blonde Hair? Check out this post for my go-to products and shades. Also, after years of not being able to find Strawberry Blonde hair extensions, I came out with my own line! They are super silky, 100% human hair, and last twice as long as most clip-in extensions. Most extensions last about 3 months with normal wear and heat-styling. Mine last 6 months or more. The quality is amazing. And most importantly, the strawberry blonde shades were matched right off my own hair color, so you can find red extensions that match right out of the box!! The website for them is www.girlgetglamorousHAIR.com. Thank you!! I’m so happy you found my blog, hopefully it will help you!! I was getting so frustrated too, my hair was always coming out too blonde, not enough strawberry. Let me know if this combo works for you! I didn’t not to go to red wanted a soft strawberry blonde so I got Nordic blonde and Titan red. What do you think of this combo? Your input would fantastic. I’ve never tried this combo, but to get a less red finish, I’d only use at most a half of a tube of the Titian Blonde to a full tube of a Blonde shade. I’d swatch this combo first on a piece of hair from the underside of your head just to make sure it doesn’t turn pink with the super light blonde shade. But definitely using less of the Titian Blonde will give you more of a strawberry blonde than a red shade 🙂 I hope this helps and good luck! * and by “to a full tube” I mean: mix half a tube of Titian Blonde with one full tube of a Light Golden Blonde of other blonde shade. I hope that’s clear, I just realized it might not be! Using the Nordic didn’t give what I thought it would. It’s not strawberry really it’s a red shade. How would I fix it put a blonde over it or a toner? I’d dhow a pic but you can’t on here. Thankyou for your advice. I love your blog and input! I’m so excited to have found your blog! I, too, started going gray at age 20 and by age 38 was 90% gray — which is approximately where I am now at age 60. At my daughter-in-law’s urging, I tried becoming a redhead last year. I not only loved what it did to my complexion and outlook but best of all, my husband LOVED it! What I did NOT love was the horribly dramatic white stripe that seemed to appear within a week of my salon-applied color as well as the cost and time required for upkeep. I’m blushing to admit I didn’t even CONSIDER taking care of the roots myself. It seemed to me that the red was such a dramatic change from my gray/white/blah and I assumed that only a professionally trained colorist could take care of it! Your blog has not only given me the final push I needed to try going red again but to take care of the roots myself. I am grateful for the inspiration you’ve provided! The various tones of red you illustrated with your photographs were quite helpful to see. However, I must tell you that I truly think almost ALL the shades of red looked wonderful against your skin tone. In fact, the shade which your friends responded to as “WAYYYY too red” looked rather stunning to me! You are able to carry the “glamour” look in a way that is also very fresh, alive, and natural (“natural” in the sense that it seems to express your essence and personality). That you have worked as a hair model comes as no surprise! Though I am older than you and I live a very different type of life (I am a decidedly UN-glamorous retired kindergarten teacher and author of children’s educational materials! LOL! ), I think the red shades of hair color seem to capture my own “inner self”, too! My spirited, happy soul and inner exuberance seem perfectly at ease with the warmth and bright tones of strawberry blonde to which I aspire! Your comment made my day! Thank you!! So glad to have given you color inspiration. I found your Pinterest, please post a pic when you go back to red, I’d love to see it!! 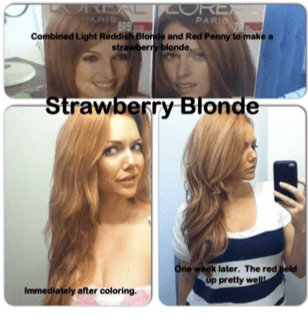 Hi there, I’m not sure the different brands in the UK, but you could go to a beauty supply store that sells color and ask for a natural or golden light blonde and a shade that is a red blonde and mix the two for a perfect strawberry blonde. I hope this helps! Thank you so much for this post! You have the most gorgeous hair! My hair has been just about every color under the sun, and I have had it done in the salon as well as on my own from a box. I would LOVE to try this gorgeous cocktail of Red Penny/Reddish Blonde, but I have a question. I went to Loreal’s website and they seem to have a Medium and a Light Reddish Blonde. Any idea what the exact shade is? Thanks so much. I’m so glad this helps!! I use Reddish Blonde and Red Penny. I’ve tried the Light Reddish Blonde and it’s so pretty but ultimately the Reddish Blonde (8RB is the number on the box) just fits my complexion the best. 🙂 I just filmed a video on how I do this, hopefully I can get up edited soon! I have naturally strawberry blonde hair, but in high school wanted a bit more red to it so started dying it once I got to college. I’ve been through a ton of bad dyes and bad salons in order to find the right color! This is so hopeful and I wish I would’ve found it sooner! Now when I dye my hair, my roots come in super blonde/gray since my hair has been bleached to get bad red dye out. My hair was so damaged and is finally returning back to healthy. I’m trying not to dye my hair every few weeks like I (stupidly) did before. But now, my roots are terrible. The rest of my hair is still a beautiful color though. So tonight I would like to purchase some color to touch up my roots and this will be my first time. I’m going to go with your use of Reddish Blonde & Red Penny! Do you have any advice/recommendations for how I should apply the color to my hair, how long I should leave it on, and if I should pull it through the rest of my hair? I also have extensions that are almost exactly my hair color. Should I let the color sit on them for a while also? Thank you for the help! And your hair is beautiful! I’m so glad this is helpful to you!! 1: You might want to try the root spray I reviewed here. It helps me stretch time in between coloring so my roots don’t look gross and my hair gets less damage from coloring. This spray has been a life saver for me! 2: I just filmed a tutorial on how I do this coloring, editing it now (editing is not my strongest suit – could take a while!) I bought a hair color mixing bottle from Sally’s Beauty ( I think it was $3 and it is reusable, just rinse it after use). It looks exactly like the kind that comes in a coloring kit, except it’s twice the size, because it has to hold double the amount of color. I poured the developer bottles from both boxes in there, then added both tubes of color. I shook it up for almost a minute straight to really get the color mixed well. Then I did my roots first and pulled the rest of the color through during the last ten minutes. I would pull the color through your extensions as well for the last ten minutes. Also, after you wash the color out, this combo can look more reddish than strawberry blonde, but if you wash it once or twice, it settles to the perfect shade (for me at least). Also, I always buy 2 boxes of Reddish Blonde and 2 boxes of Red Penny at a time (and when they are on sale I clean out the shelves – lol). That way, in case I need more color (my hair is thick and when I had extensions I always used a ton of color to get all the extensions saturated). Just mix two boxes first, and if you don’t need the second ones then you are all stocked up for next time 🙂 It’s my safety net! I hope this helps, let me know if you have any other questions about how I do this color. And thank you for the compliment, that is really sweet of you to say! wow I cant tell you how excited I am that I found this post!!!!! I myself have used the lighter reddish blonde but the color just wasn’t rich enough for me but I was too scared to used the darker one but I will definitely try mixing it with red penny. I just recently died my hair with one of their warm blonds I cant remember the name but all the warmth is washed out. I was wondering if it would be okay to just try this combo right away or if I should wait a bit and if I DO go ahead and dye it now should I do my roots first and my ends for ten minutes or just put the color all over for the full 30 minutes? I’m so glad you found this post helpful!! This combo seems to really work for me. Hopefully it will for you too! I would try 15 minutes on your roots and 15 pulling it through the ends for 30 min total. It comes out more red than strawberry blonde the first couple of days/washes then it is a beautiful strawberry blonde. Mine needs to be colored really badly right now and it’s a very light strawberry blonde. I hope all this helps!! 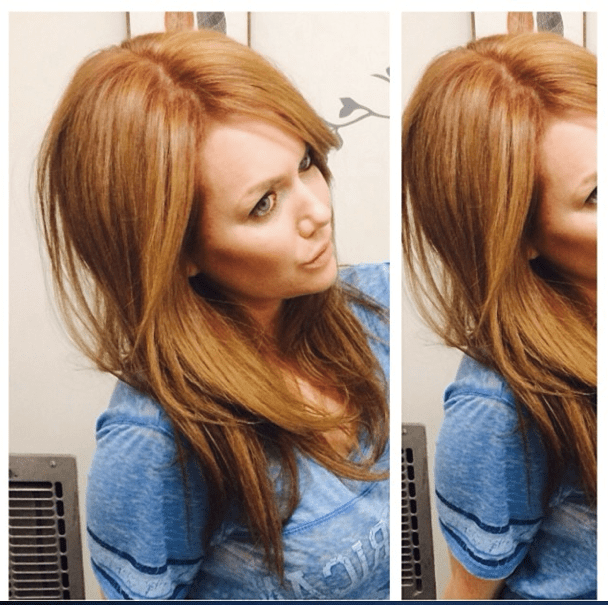 Have you ever gotten your hair colored and turned out kind of orange? Mine is pretty vibrant orange right now. I’m going to California in a week and I would like it to shift to a soft strawberry blonde. I sometimes think mine comes out a too orange (the base is red-orange) but I haven’t had vibrant orange. I might do a consult with a hair dresser and maybe have them do the strawberry blonde for you, then you can keep the roots up yourself. Just so it def comes out the shade you want for your trip. I wish I could be more helpful for a do-it-yourself route, but I also want it to look great for you and I don’t want to tell you the wrong thing!! I just recently used the Reddish Blonde dye in my hair (thank you for the suggestion) and absolutely love the color! My hair was pretty much platinum blonde before I dyed it. I was just wondering what your suggestion would be as far as shampoo to use and how often to shampoo in order to preserve the color. I’ve been red before and had to redye my hair like once a week in order to keep the right color. I’m glad the Reddish Blonde worked for you! I’m working on a whole post about preserving hair color, but for shampoos and conditioners I really like Kerastase and Living Proof products. On the drugstore end, I really like Suave Professionals Natural Infusion Anti-Breakage shampoo and conditioner. And I use medium to medium-cool heat water. I hope this helps!! I was wondering how long you go between coloring? I go anywhere from 4 to 6 weeks in between coloring, depending on how much my color has faded. In the summer, with the sun being so intense, I do feel like I have to color every 4 weeks. I use Rita Hazan root spray in between, when my roots start showing. Hmm. I am not a hair colorist, so I’m kind of stumped on this one and don’t want to tell you the wrong thing!! The last two times I colored my hair at home, I put coconut oil (I get it from Trader Joe’s or Whole Foods) on the last two inches of my hair because my ends are really dry. It soaks into the ends, then for the last ten minutes I pull the color all the way through. So I’d recommend that, and doing 20 min on your roots, then the last ten minutes on your ends, but the coconut oil will help so that your ends come out conditioned and healthy looking. I hope this helps! My roots start showing after a week and a half, by the end of week two O can’t take it anymore. What exactly does the Rita Hazan spray do? I know, roots drive me nuts too. It’s like – whats the point of coloring if everyone can see my roots?? The Rita Hazan spray is just a temporary spray cover up. I part my hair and spray it on the part so the greys are covered. I did the full review with pics here: http://girlgetglamorous.com/?p=1419 . Also, that post has some tips on how to use the spray the best way. I hope it helps! Thank you! Love the color! I’m rather cool-toned. It seems half articles I’ve read from even stylists say if you’re cool always stay cool hair. The other half says soft warm tones for pale cool tones. And then there are the ones that say the only red hair for me would be strawberry blonde. I know not to rely on that but still confusing. I have looked ok in golden browns before so I don’t know. I’d be going to a salon but I’m sort of scared if they mess it up or make it too brassy … I’ve held up swatches to my face before and they haven’t looked bad. I’d be going after something dark or medium blonde level. Any thoughts on it? I mean without seeing me. Thanks so much. You are so gorgeous and your hair is such a nice color! 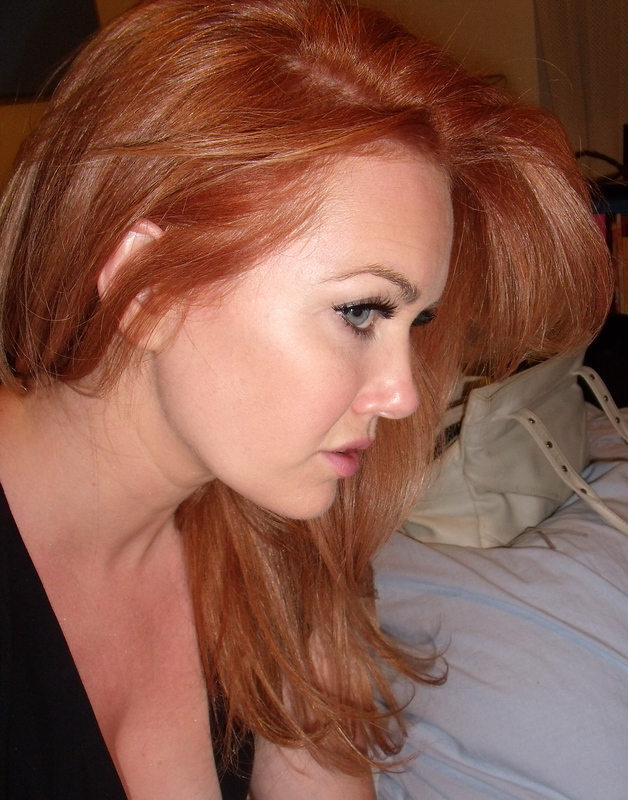 Ok so I took the plunge And got the same colors for your strawberry blonde….all I can say is wow! I was super nervous I’ve never been anything but blonde…this is my favorite color on earth….it brings out such pink/peachiness in my face…I looke alive! Awesome combo…thanks so much for your advice! I’m so glad it worked out for you!!!! Hashtag a pic #girlgetglamorous on Instagram if you have Insta, I want to see a pic! This post is awesome and so informative! I just have one question- for the reddish blonde from l’oreal are you using the light reddish blonde (level 9) or the medium reddish blonde (level 8) I did a google search and those were both “reddish blonde” from that brand. So glad this post was helpful for you! I used the medium reddish blonde, in level 8. The lighter shade was gorgeous, just too light for me. I hope this helps! Very helpful. And my god are you BEAUTIFUL!! -19 y/o female hoping to do this color! I’m so glad this was helpful and thank you!!! That is so nice of you to say and it made my day! 🙂 Let me know if you try this hair color! Super helpful post, thank you. And it’s been said a million times but your hair is lovely! Wondering if you have any advice for me. I have naturally mousy light red hair, but it’s dull and not vibrant which is why I started dying in the first place. 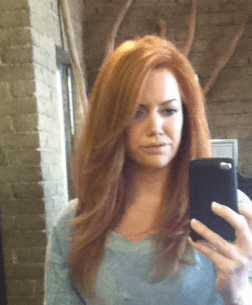 I had success dying my hair auburn on my own for a while but had a bright red mishap and started going to Aveda Institute in West LA. They’ve always done a pretty good job with my auburn but now I want to go back to light red/strawberry blonde. Well I had strawberry blonde highlights done there the other day (they didn’t want to bleach my whole head to go back to light red, they said better to do a little at a time), and it’s just not the light red/strawberry I was hoping for. My auburn has faded quite a bit so now I’m more of a medium red with the highlights (which like I said aren’t super noticeable). Is it possible to put your color combo over what I have or will that not work? You mentioned you’ve tried lots of different reds and blondes, did you just keep dying over or did you strip the color in between? Also, since I’m in LA too, do you mind if I ask a ballpark of what your stylist at Art Lab charges? The color is gorgeous! And when you get colored by him, do you use your box color/combo for roots so it’s not so expensive every 6 weeks? Thank you for the compliment! I have had so many a hair mishap as well, so I feel you on this question! I actually used to be a hair model for Aveda, so I remember their line of color, they do have a nice range of coppers and auburns. I have always just done color over color, never stripped in between. There was a faint strip at the roots that was a slightly different shade than the rest of the hair the first time I went back to strawberry blonde. But that was the the first time. I am working on a new post that will be up within the next week about Wella Color Charm. It will be my Epic Journey Part 2 post! I am experimenting and loving the strawberry blondes from them. I will try and hurry up with the post so you can see the color combos I tried and see if one might work for you. I think even if you have someone else do the strawberry blonde for you, you could keep the roots up yourself. I hope this helps and I will have the other post up as soon as I get write it! Hi! Thanks so much for sharing this! I’m naturally a warm strawberry blonde/copper red and had to start coloring a few years ago to cover my grey (I’m 41). I too have tried tons of strawberry/red colors and they are always either too light or too dark. This winter I found loreal ginger twist which is the right for family but still too dark (but better with the highlights provided). I was considering mixing the ginger twist with loreal light reddish blonde to get the color I want. Your post has inspired me to go for it! Wish me luck! I hope it goes well! I also just updated this post with the “Part 2”. I’ve been using Wella Color Charm and love the results. Let me know which one you do! With either brand, I think mixing is the way to go, it’s given me the most natural results. So glad you found the blog!! I’m just fascinated with your blog like the rest of the girls and feel very grateful with you for sharing your secrets. I’ve also been coloring my hair since I was 17 now I’m 57!!. I like the red/blonde and have tried many colors and combinations at the salon and at home. I just bought a Dark Red Blonde and a Medium Tangerine Blonde from Sally’s and I’m planning to use a 30 crème developer. My natural hair is dark brown and right now is a faded Medium Reddish blonde (looks more like a Light Copperish). I want it to be Strawberry Blonde but I can’t seem to get at it regardless of where I do it or the product I use. I was doing research to see if I could mix these colors or just alternate them when I was lucky enough to come across your Blog! You are very attractive and look SUPER in all the different shades. I particularly like the color on your first picture (dress in white) then the one for the show (dress in black). Well…wish me luck on this experiment! and thanks again for sharing so much info! Thank you, so many nice compliments!! So glad this post is helpful. Let me know how your hair comes out. 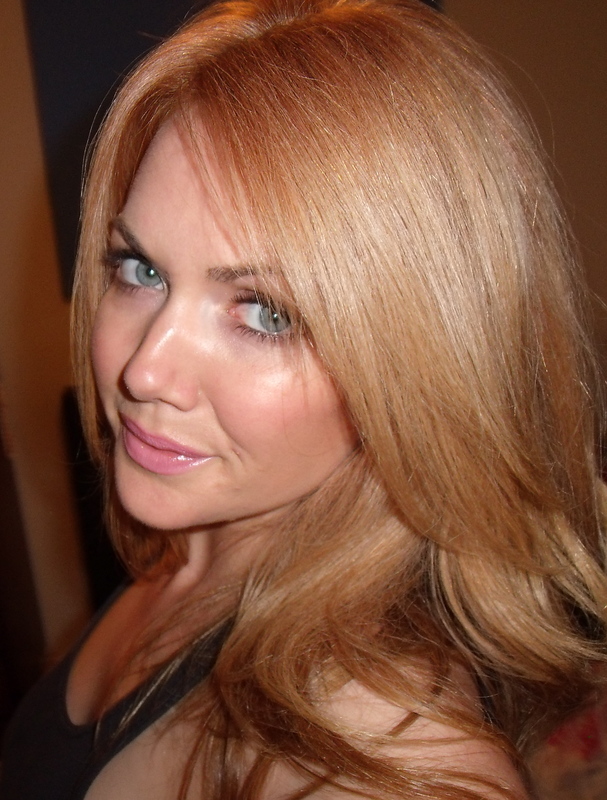 I just posted a new post on strawberry blonde hair at home using Wella Color charm from Sally’s. You might like that one too. Let me know which combo you go for! Hi Kaitlin, sorry I just saw this somehow! I think the Wella might be a good choice for you if you are concerned about fading. I would say try the Well Titian with Golden Blonde and maybe only use 1.5oz of the Golden Blonde with 2 oz (Full tube) of the Titian Blonde. (plus 7 oz developer) The Wella has been great for me, with minimal fading. If you want your color to be more golden, do full tubes of both shades (plus 8 oz developer). I hope this helps!! Thank you, you are so sweet! I do love coloring and playing with my hair at home too. It’s so much fun, even though I love my hairdresser. But I also love being able to share and help other women who want to go strawberry blonde with all the shades I have tried. I’ve tried so much I have to share it!! I live in New Zealand and I think we have a very limited range of colours….anyway tonight I will take a look for these colours you have mentioned. Naturally my hair is like a tabby cat, I suit basically all the colours but especially blonde and red. So I think this colour will look fantastic 😀 thanks for posting this…you have helped me with my decision. Will post again once I’m finished!!! btw your hair looks beautiful this strawberry blonde colour! Thank you, so nice of you to say! Did you find the colors? I would love to see how it comes out!! Love your hair color with the mix. I really want to try it, but honestly…the Reddish Blonde 8RB doesn’t look blonde at all on the box. Then, mixing it with an even darker red…scares me. The ultimate look I want is of the “Light Reddish Blond” with darker streaks of red. My hair is already a light/dirty blonde mix. I was thinking of trying the light and mixing with the medium/8rb. What are your thoughts? I know results are different for us all…. So glad it helped! Change is fun and I agree, best done slightly less drastic at first. Haha! Good luck!! Thank you so much for this post! I’m trying this tonight!!! I’ve tried so many different hair dyes and the color is never right but I LOVE how yours came out and i’m hoping mine comes out the same! Thank you! That’s so nice of you. I hope it comes out beautiful and exactly like you want it to look! I’m so glad you got a color you love! I’ve always been curious about that L’Oreal Lighest Auburn, it’s the one shade I never tried!! You should give the koleston perfect line a go. I usually mix 3 parts 9/03, 0.5 part 8/43 and 0.5 part 8/34. Comesa out flawless every time! My hair is a level 7 naturally. Thank you, I haven’t heard of this line but I will def look into it. Thank you for sharing!! Hi there! I’ve had highlights put in before (I always have someone do these for me, I’m too scared to highlight at home) when my hair has come out too dark and it made it the perfect strawberry blonde shade! So I highly recommend trying some highlights to lighten the dark ends to match your lighter roots. I hope this helps! Great advice, thank you! Have you tried it on your hair? Can you tag me in a pic on Instagram – @girlgetglamorous. Thank you for sharing!! Hi! So I’ve had medium copper red hair (over natural dark brown hair) for the past few months, and I’ve been wanting to go lighter to possibly a strawberry blonde or light auburn/copper, but I’ve been afraid of adding bleach to it without it looking pink/orange. I am in love with your strawberry blonde hair! Is it even possible to achieve your hair color from my copper red hair? Thanks! Your blog is THE BEST for strawberry blondes. I just had mine done by a pro but it came out too dark and more cherry than strawberry. How did you deal when your experiments came out darker than you wanted! Did anything work to lighten it? I am not known for my patience and I hate having hair that looks clearly un-natural. That color was done by a stylist years ago and I don’t know what he used – sorry! But I think the photographer also retouched the color a bit 😉 The closest I’ve come to recreating it is with the L’Oreal INOA colors from “Part 3” post. I hope this helps! How much of the strawberry blonde and red penny did you use to mix? Thank you so much for the tutorial and brave enough to publicly share your journey! After years of salon dyeing my natural red hair, I’ve had everything from blonde to brunette, and now I am sandy blonde with red, I guess a toned down true strawberry blonde. I’m currently a level 8NG Sand Blonde with a hint of red and the roots are 8-9 weeks old. I’ve decided to give Wella Color Charm a try at home. I went down to Sally’s and upon some consultation with the manager, purchased a 9NG Sand Blonde (she said it will darken after adding the 8RG) and plan on mixing it with half of the 8RG Titian Red Blonde with the 20 Volume Cream Developer. I’ve never dyed my own hair and am terrified. Any last words of wisdom before I take the plunge? My favorite on you was when you mixed the two loreal colors…gorgeous !!! I can also relate- went white in my 20’s too, now I am a light blonde. I was wondering if any Canadian readers have some guidance as to the crossover shades available here. 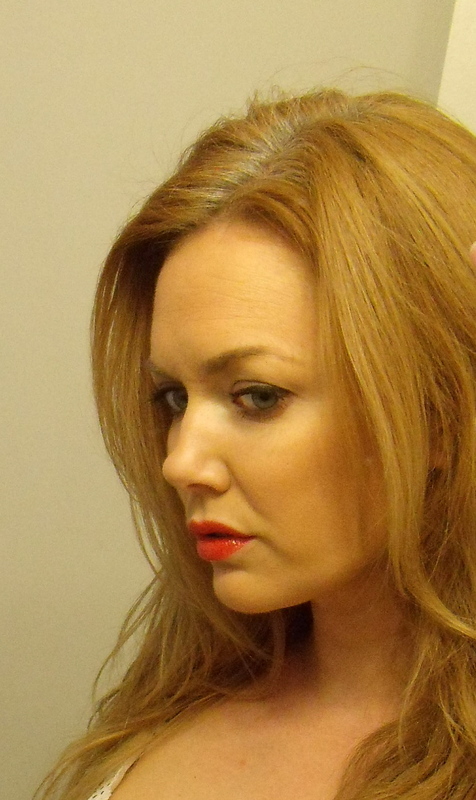 In the L’Oreal Excellence Crème line, the closest I could find to the ‘Reddish Blonde’ is ‘C34 Copper Blonde’. The shade appears to be the same, and it’s the exact same woman/hairstyle on the front of the box, however the shade name differs. As for the ‘Red Penny’, the closest equivalent appears to be the ‘E6 Light Auburn Brown’ ? Did you ever figure out how close these shades are? I usually use 8rb but they haven’t shipped it from the states yet and I bought C34 and am nervous it will be a different shade. Just being honest, I followed your instructions for mixing the reddish blonde and red penny..it made me look like a clown. Sorry to hear that you weren’t happy with the results. Hair color does really vary so much based on what you are starting with as a base. As much as I loved the L’Oreal formula and their red shades, I do find that they fade quickly, so I had to add the Red Penny to the mix, which resulted in hair that was a bit too red the first week or so before it began to fade. Since I have switched over to using the Wella Color Charm, I’ve found that I have a lot ore control over the tones I add. I can add more brown or blonde to the red as needed to tone it down. I posted these formulas in Strawberry Blonde Part 3. I hope this helps, I do truly want everyone to love the color they end up with! Thank you! I put most of the stores I’m shopping at up in the “shop” tab. I get most of my tops from Forever 21 🙂 I hope this helps, thanks for the compliment! Hello there! So my hair is naturally strawberry blonde. As a child I was a vived strawberry, but over the years the colour has seemed to dull into a muggy, rusty colour. Do you have any idea why, or is this just because of age? Hi Molly, I wanted to know what color hair you had.before you put on teh 8G/8RG combo- was it brown or blonde? I have very palen (almost ashey) blonde hair, (with bleach) and med-light (slightly golden) brown hair underneith. I want to cover my blonde with some red color because i dont want to keep using bleach- my hair is fine and its damaging it. just wondered what color you had previously to achieve that final color. Its a bit too expensive at a solon, and i do love the color you have!